← Exchange Online and Native Data Protection – No Backups Baby! Playing around with the Get-MailboxFolderStatistics cmdlet the other day (as you do), I noticed that the number of items reported for the Inbox folder (8,443) didn’t match the number shown by Outlook (8,009). Of course, Outlook Web App has the good sense not to display the total number of items in a folder so as to avoid these kind of debates, but once I had noticed the discrepancy, it was time to check it out. Nothing quite reveals the secrets that lurk inside Exchange mailboxes like MFCMAPI does. It’s a utility that should really be close at hand for any Exchange administrator because of its usefulness in many situations. In this case, all I wanted to do was to poke around the Inbox, but that’s only the start of what you can do with the program. MFCMAPI works for both on-premises and cloud Exchange mailboxes. 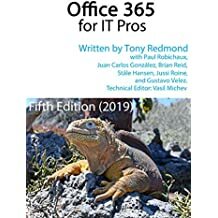 To be sure that you see everything, configure your Outlook profile to connect directly to the server rather than running in cached Exchange mode, which is the most common method used to run Outlook. A quick change to Outlook’s settings and MFCMAPI was ready to roll. The answer is actually pretty simple. The Inbox folder is used as a convenient storage location for all manner of folder associated items (FAIs), hidden items created by Exchange and clients to store settings and all manner of configuration details. The Inbox is used because you can always be sure that it’s in a mailbox. The FAIs are stored in the folder’s associated contents table rather than the normal table used for regular mailbox items. For example, Exchange’s Messaging Records Management (MRM) features store details about the retention policy that is assigned to a mailbox, including the retention tags in the policy, in an FAI, which is created the first time a mailbox is processed by the Managed Folder Assistant following the assignment of the policy. Another FAI is used to hold details of RSS feeds. 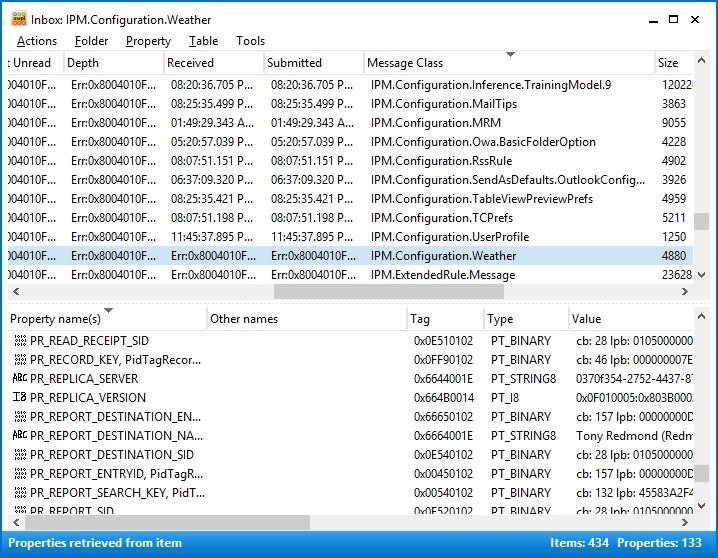 A client-specific example is the weather settings FAI, which is created by Outlook 2013 to store details of the location selected for weather information displayed in the Calendar. But the biggest set of FAIs accumulated in the Inbox were those created to help the Clutter feature in Exchange Online to figure out what messages are important to a user and what are not. In my case, hundreds of FAIs hold training information gathered through observation of how I deal with messages – the ones I delete unread, the ones I move to the Clutter folder, the ones that I answer immediately, and so on. These items represent some of the “signals” gathered by Clutter to help it sort out the messages that arrive into an Inbox into those that should remain in the Inbox and those that should be redirected into the Clutter folder. See my FAQ for more information on how Clutter works. The fact that Clutter creates so many FAIs isn’t really a problem because the items themselves are pretty small and anyway, given that mailboxes are so massive now, the couple of hundred kilobytes consumed to train my mailbox to behave properly seems like a good investment. This entry was posted in Cloud, Email, Exchange, Office 365 and tagged Clutter, Exchange Online, FAI, Folder Associated Item, MFCMAPI, Office 365. Bookmark the permalink.